Chevrolet Colorado WT and Colorado Z71Chevrolet Silverado 3500 HDFord F150 2.7L EcoBoost and 3.5L EcoBoostFord F-450Ford Transit 350 HR and Transit 150 MRGMC Canyon SLTGMC Sierra Denali 2500 HD. 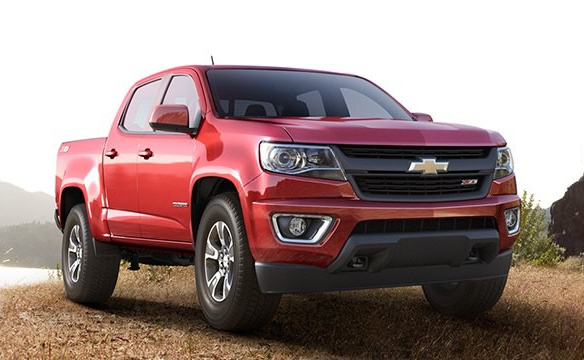 The 2015 Colorado emerged as MOTOR TREND’s 2015 Truck of the Year by a rare unanimous vote. The editors were particularly impressed with Colorado’s handsome, clean-sheet design, “right-sized” package, excellent handling and overall capability. Colorado’s potent-yet-efficient powertrains also returned best-in-class fuel economy according to Real MPG and EPA testing. To determine which truck deserved top honors, the MOTOR TREND test team subjected all of the contenders to numerous instrumented and real-world road tests. First up was standard MOTOR TRENDtesting, which included: 0-60 mph and 1/4-mile acceleration, 60-0 mph braking, and maximum lateral grip – all without payload or trailered loads. A specific payload was then added to each truck and van, and the vehicles were then driven more than 250 miles to the Arizona/Nevada border to evaluate ride quality and loaded fuel economy. The vehicles were driven up and down the famed Davis Dam in Bullhead City, Ariz., for further assessment, including an instrumented test designed to simulate a passing situation while carrying a load. The team then moved to a world-class automotive proving grounds for instrumented acceleration tests with nominal weight trailers. Truck and trailer were also driven through a short handling course to evaluate acceleration, braking, maneuverability and outward visibility. The final phase of evaluation involved a 21-mile road loop through hills of Arizona’s Hualapai Mountains. Following the team’s intensive evaluation, the trucks were shipped to MOTOR TREND headquarters in El Segundo to undergo proprietary “Real MPG” fuel-economy testing. Using advanced exhaust gas and flow-rate analyzers, Real MPG measures tailpipe emissions every second during a three-hour, 88-mile drive around the Los Angeles area to record accurate real-world fuel economy. Once testing was completed, select MOTOR TREND editors convened to determine which truck would be crowned Truck of the Year. The winner is not chosen from a direct comparison against the other contenders, but rather as a result of how each contender performed in testing and ag360t the award’s six criteria: Design Advancement, Engineering Excellence, Efficiency, Safety, Value, and Performance of Intended Function. MOTOR TREND®, a media brand of TEN: The Enthusiast Network, was founded in 1949 and is internationally recognized as one of the leading brands in the automotive category. The MOTOR TREND brand is comprised of Motor Trend Magazine; the award-winning website MOTORTREND.com; MOTOR TREND Auto Shows; MOTOR TREND Audio; MOTOR TREND en Espanol; MOTOR TREND India; and the renowned MOTOR TREND Car of the Year, SUV of the Year, Truck of the Year, and Best Driver’s Car awards programs. Founded in 1911 in Detroit, Chevrolet is one of the world’s largest car brands, doing business in more than 140 countries and selling more than 4.9 million cars and trucks a year. Chevrolet provides customers with fuel-efficient vehicles that feature spirited performance, expressive design, and high quality. More information on Chevrolet models can be found at www.chevrolet.com. TEN: The Enthusiast Network is the world’s premier network of enthusiast brands, such as MOTOR TREND, AUTOMOBILE, HOT ROD, SURFER, TRANSWORLD, and GRINDTV. With more than 50 publications, 60 websites, 50 events, 1,000 branded products, the world’s largest automotive VOD channel, and the world’s largest action/adventure sports media platform, TEN inspires enthusiasts to pursue their passions. For more information, visit www.enthusiastnetwork.com.